A few weeks ago, one of my girl friends and I decided to take her son and go on a little field trip. So we got up bright and early and headed to Spring Valley, Wisconsin. It's about two hours from home and the place where you can find the longest cave in Wisconsin. 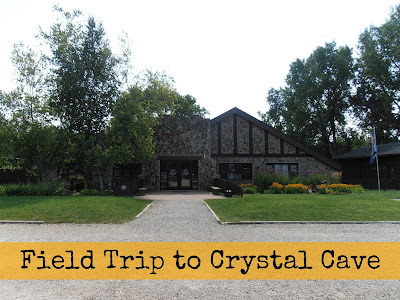 Crystal Cave is pretty much the epitome of a grade school field trip spot. It's situated slightly out of town in a nice grassy area complete with picnic area and flowers. The building that houses the cave entrance was built in 1942. To get to the cave, you have to take some stairs inside the building that seem to lead to the basement in the cave. Inside, there are chairs and your guide will give you a little speech about not touching the cave walls, don't be afraid if you see a bat, etc. etc. And then your led down even farther. At the deepest point, you're more than 70 feet underground. Crystal Cave is very well lit, and the path is very smooth. The cave temp is always a cozy 50 degrees. Our guide explained that all caves are always the average of their year round temp. So, caves farther south would be warmer, and caves farther north would be cooler. I didn't really get any good pictures inside the cave but it's very pretty. Your guide will show you stalactites, stalagmites, soda straws, and even some fossils. It was really interesting to go back as an adult and I think the hour was worth the $15 admission price. The tour is very interactive with the guide stopping to ask questions and point out interesting things. Once we were done with the tour, we decided to go "panning for gemstones" for an additional $6 when you buy your ticket you can get a token to get a bag of sand loaded with gemstones and rocks and take them out to a sluice outside to see what your bag contains. We cashed in our tokens and went panning. My friend Danielle and her son, panning. It was actually pretty fun, and I think my friend Danielle and I enjoyed it just as much as her son did. Our tour guide hung out at the sluicing area and told us the names of what we found too, which was nice. So, if you're ever near Spring Green, which is a little over an hour east of the Twin Cities, I really recommend taking the tour. It's educational, it's entertaining, and it's fun for both kids and adults.